Autumn is often the season of dread for me as the days get noticably shorter and the weather becomes increasingly gloomy. But the colours of the leaves, the shades of clothes it becomes ‘acceptable’ to wear and the shift in mentality towards snug evenings and thick pjs makes it that little bit better. 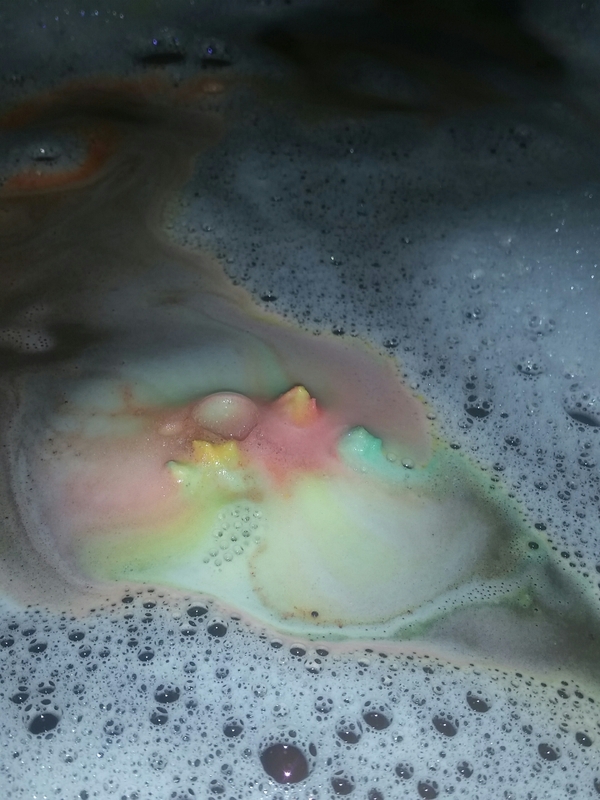 And it was those things that made this bath bomb interest me because I hoped to be taken back to bonfires, fireworks, autumn colours and being surrounded by the warmth of the bath like you are standing by the fire and waiting for a marshmallow to toast. It seems though, even for people that have stored Lush products perfectly well for a number of years, that this years Autumn/Winter collections are becoming increasingly difficult to preserve and this one proved to be no exception as it crumbled up on holding and trying to move around. Hardly a good start to it showing its full beauty..
And the desciption confused me a little as to me fresh grass comes from the first cutting of the garden for the year as to me autumn grass has a specific damp and earthy smell to it rather than being fresh and vibrant. Despite its initial crumbling issues this particular autumn leaf managed to hold together and keep its structure on being nervously placed in the water. As a result it did seem to initially fizz quite quickly with the outside crumbling layer being captured by the water but after that it settled down and resumed a more leisurely pace of disappearing. I loved watching this product in the water, it bobbing along much like a leaf would in water, and the colours that it was able to produce. From the initial almost straight lines creating a leafy vein pattern above the water to them all starting to seirl together to create a collage of beautiful autumnal shades. 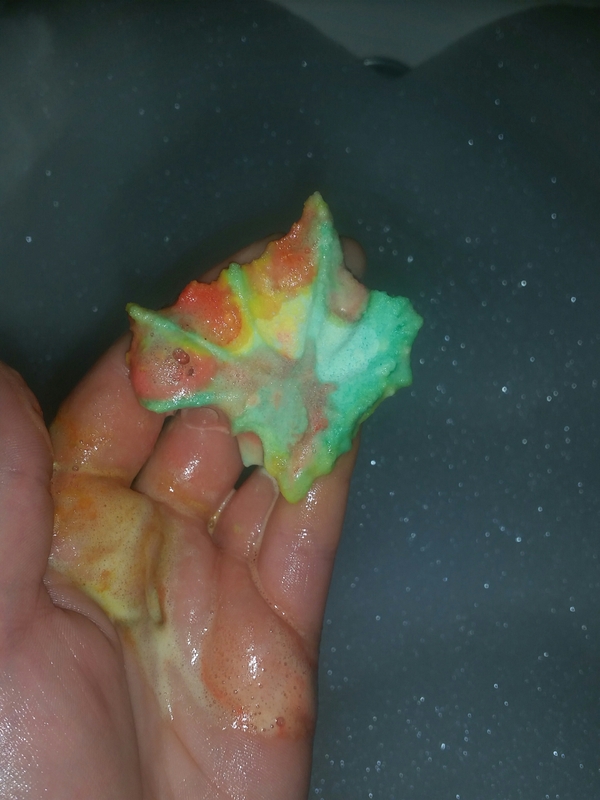 The aroma that came out of the bath bomb was indeed a classic autumnal smell as if you walked through a park on an early October Sunday morning. There was a richness and earthy feel from it but it was not too overwhelming that it felt like you were about to sit in a bath of tree bark. Slowly the product faded away revealing a much more gentle pastel collection of shades among the bubbles on the top of the water and at that point my mind became confused as the colours on top screamed spring but the smells were strongly autumnal. With notes of bergamot oil, neroli oil and sandalwood oil it did remind me of a harvest festival with pierced oranges, a log burning fire and the musky dampness from the weather outside. It gave the water a wonderfully soft feel and not only did it help soothe my skin but also my hair came out of the bath softer than it has in a very long time. The combination of those oils and other ingredients really helped to work wonders for my personal skin type and it was made all the more enjoyable by a balance of flavours that actually evoked pleasing memories. The smell was not present on my skin afterwards but given the scents used this is not something that bothered me too much. Once all those vibrant and pastel colours had mixed together the water underneath was a far less pleasing shade of a murky orange brown. It reminded me of when there has been too much rain on a hillside that has some clay present in it and instead of running like wet mud it becomes a grey, brown and red sort of mixture that just looks displeasing. 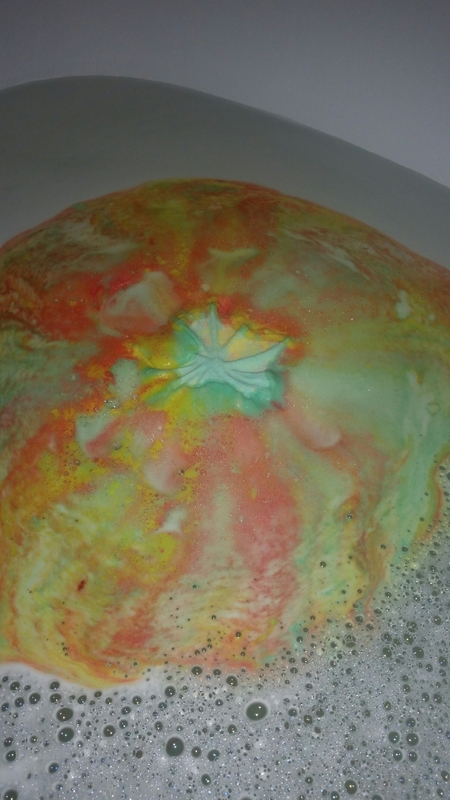 Luckily the bubbles held out for quite a long time and I was able to ignore the rather unwanted colour of the bath water. When putting it into the water I had imagined a green to match the talk of grass or a more vibrant colour of an autumnal leaf but clearly my expectations were wrong with that. 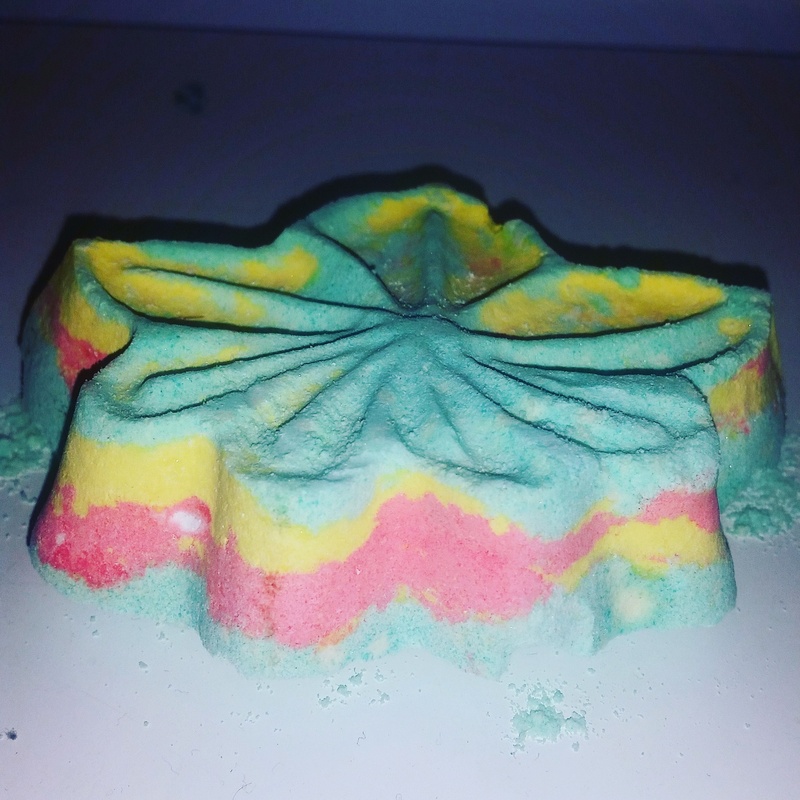 This may well be my favourite bath bomb of the ones I have tried since the start of December and I hope that it makes a return at the seasonally appropriate times in the future. It initially fizzed well, looked pretty on the top, had a reasonable smell kick out without being overwhelming or instantly fading and worked wonders on my skin and hair. 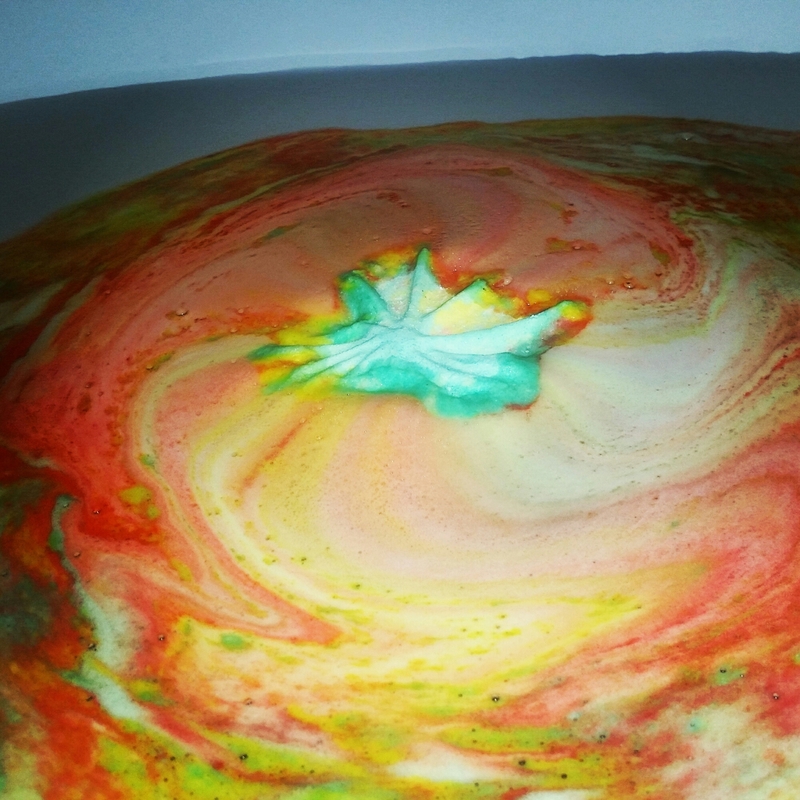 This entry was posted in Bath/Shower, Beauty and tagged autumn, autumn 2016, autumn leaf, autumnal, ballistic, bath, bath bomb, bblog, bblogger, bbloggers, Beauty, beauty blog, beauty blogger, beauty bloggers, beauty product, beauty review, colourful, colours, lblog, lblogger, lbloggers, life, Lifestyle, lifestyle blog, lifestyle blogger, lifestyle bloggers, limited edition, lush, lush cosmetics, pamper, review, selfcare, winter 2016. Bookmark the permalink.